Nigeria’s Bayelsa State was home to three kidnapping attempts on April 24th. A total of 9 hostages were taken from two vessels by kidnappers, while a third kidnapping attempt was unsuccessful. The identity of the kidnappers is unknown, although they are believed to be the same men accused of killing 12 police officers three weeks ago. 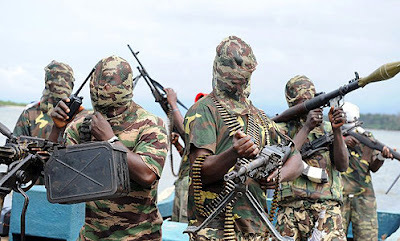 The hostages are almost all Nigerian oil workers, but reports indicate a Russian and a Malaysian may be included. The attacks happened at different times and locations. In the largest and most publicized attack, 5 workers were taken from a vessel in the waters off the coast of Brass, a Local Government Area in Nigeria. Fishermen in the area witnessed one kidnapping, reporting the kidnappers boarded the vessel armed and took 5 men and cash. In the other successful kidnapping, located north-east of the first, off the coast of the Port of Harcourt, four men were taken from a container ship. The remaining crew in both kidnappings were left unharmed. A third attempt at a kidnapping happened the same day, as attackers in a speed boat attempted to board another vessel. This time, the vessel increased speed and managed to get away. Bayelsa state, and the water off its coast, is considered an exceptionally turbulent region. Incidents of violence have led to increases in insurance for much of the Gulf of Guinea, which follows Africa’s southward curve from Liberia to Gabon.